ZeoPet – a complex nutritional supplement for pets. It’s produced from high-quality, natural mineral – Zeolite – in a particular spatial configuration – Clinoptilolite. ZeoPet is an effective natural sorbent, ion exchanger, and catalyst, which assists the rapid formation and growth of the animal’s organs and organ systems. When zeolite enters the animal’s digestive tract, it improves the process of excretion of dangerous low-molecular waste and toxins; furthermore, it normalizes and enriches mineral metabolism, which is especially crucial during the animal’s growth. By absorbing heavy metals, radionuclides, inorganic toxins and wastes of various origins, zeolite provides the animal’s body with essential microelements and valuable mineral components. Improvement of the digestive system, as well as the support of the rapid formation of organs and organ systems in the growing animals. Normalization and enrichment of the mineral balance, which becomes visible in the improved quality of skin, fur, and skeletal structure. Prevention and protection of the animal’s liver and kidneys from the destructive effects of mineral imbalance and the toxic impact of low-molecular free radicals. 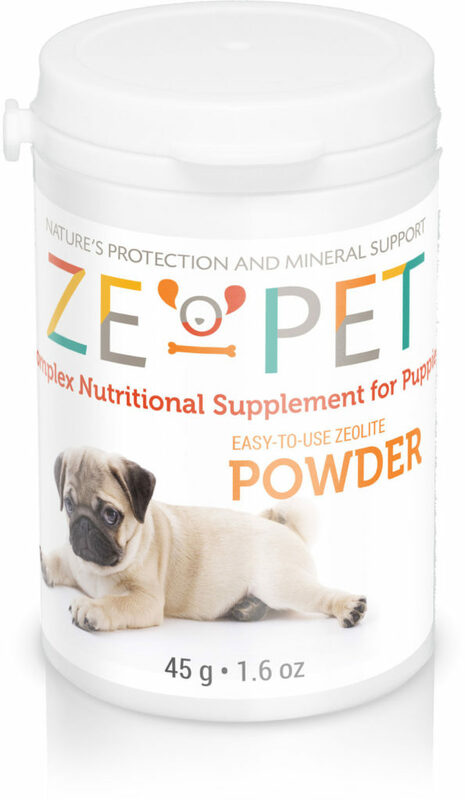 In combination with its mineral components, Zeolite’s effect as an efficient sorbent (cleaner) can have a positive effect on the animal’s dynamics and quality of the puppy’s growing body. To achieve visible results, mix into your puppy’s food immediately before feeding once a day for 4 weeks using the measuring spoon included. Proportions: 1 g supplement (1 measuring spoon) per 2 kg of body weight once a day for 4 weeks.